One of myCRED’s core features is the ability to award or deduct points from a user for interacting with your website. The automatic point adjustments are called “Hooks”, as you have to “hook into” a particular event e.g. when users logging in to see if they should get points. As of version 1.4, you can award multiple point types for the same event, e.g. giving users 10 points and maybe 1 token for logging in. 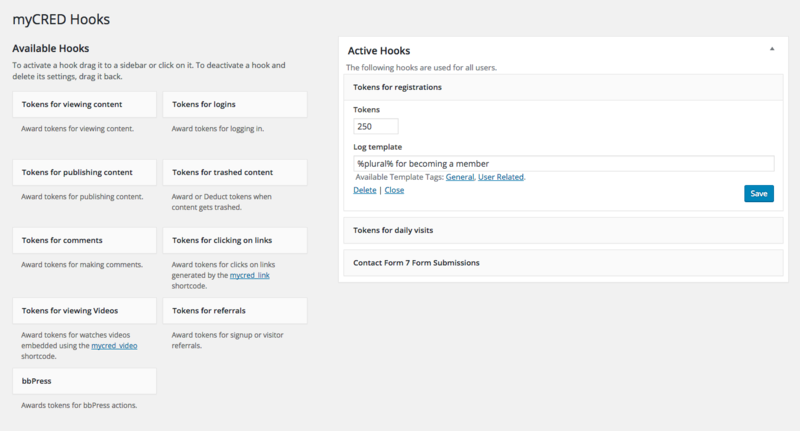 You can find your hook settings in your admin area on the myCRED > Hooks page. As of version 1.7, hooks are managed just like widgets in WordPress. To enable a hook, you drag it to the “Active Hooks” sidebar. To disable, you drag the hook back to the list. Points for daily site visit. Points for approved / trashed / spammed comments. * Does not support AJAX loaded pages. Besides WordPress, myCRED also has built-in support for some of the most popular third-party plugins, like Jetpack, WooCommerce, BuddyPress, bbPress etc. In addition, a growing number of plugins have begun adding support for myCRED from their own end. You can find all third-party plugins that myCRED supports here. As of version 1.4, myCRED hooks have built-in support for setting limits. The limit defines the number of times a user gains points, and not the amount of points they gain. You can select to enforce a daily, weekly or monthly limit. Limits are only available for hooks where there are no built-in limit option. For example the “Points for daily visit” has a built-in daily limit so it does not have a “hook limit”. Since the limit is enforced using the log, you can not award / deduct points via hooks with empty log entry templates! This hook comes with the mycred_link custom shortcode. Using this shortcode will generate links that when a logged in user clicks on it, they can receive points. This custom hook allows you to give your users points for watching embedded YouTube videos. In order for this to work, you must embed your videos using the mycred_video shortcode. Note that users can only gain points once per video. This is a very basic affiliate hook that allows your users to earn points for referring visitors and / or signups. This hook uses the mycred_affiliate_link and the mycred_affiliate_id shortcodes. You can read more about how to install and setup this hook here. The Points for referral hook is very basic and is not built for complex affiliate setups. If you need an advanced affiliate tool, I highly recommend AffiliateWP which myCRED has built-in support for.